Jeans is a unique piece of clothing. Why? The warp yarn of the denim is dyed with indigo, a special dyestuff. The ring dyeing (only dyeing the outer fibres of the yarn) which enables the high-contrast ageing resp. used effect. This special piece of clothing is also a challenge for the jeans washers. The demands are equally high in the field of non-denims. The fluffy, soft favourite T-shirt should still look good after several washings without loss in colour and without pilling so that we can enjoy it for a long time. Highly efficient low temperature amylases ensure quick decomposition of starch sizes and low backstaining. Cellulases for processes at energy saving 30 °C or for highly effective 45 °C. Optimal formulation for strong results and low backstaining. Effective anti-pilling with acid cellulases in GOTS quality or with neutral cellulases for lowest colour change and backstaining. The organIQ BIOPOWER now also promotes the modern fog application which saves resources. Special anti-backstaining formulations ensure that detached indigo remains in the treatment bath and at the same time ensures that the jeans are protected from dirt particles adhering to the fibres. Double protection for a good salt 'n' pepper effect. Particularly in seasons of more clean, darker styles, fastness improvement of indigo dyeings is a major topic. Especially the rubbing fastness is often a problem on dark denims due to the low dyestuff fixation. Here we have also solutions for various treatment methods. A softener for a special handle is a must for every piece of clothing. 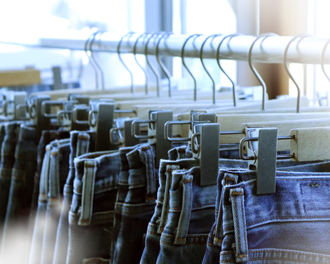 Denims and non-denims often make different demands on the softener. The main emphasis on blue denims may be the delay of indigo yellowing caused by harmful gases and on non-denims maybe to get as much as possible out of the various materials. Supersoft, creamy, waxy, hydrophilic or perhaps with fragrance or care substances? Our absolutely strongest point is bleaching since CHT is the leading company in ecological bleaching processes for the jeans industry. For common bleaching processes we additionally offer bleaching activators which allow for reducing the use of chlorine bleaching lye and potassium permanganate. For the peroxide bleach, e.g. for the popular black denim jeans, we also offer products which prevent metal zips and fashion applications such as rivets from damaging the jeans catalytically. These products avoid the formation of stains and simultaneously stabilise the peroxide for an optimum exploitation. It’s our optical brighteners that make your white summer jeans or chinos really bright white.